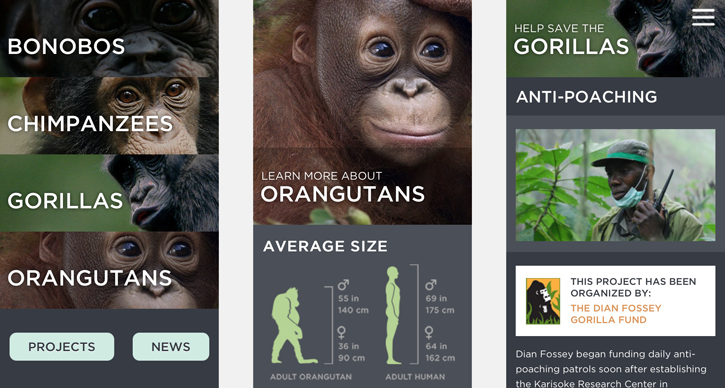 Our newly launched app developed for the Great Apes Survival Partnership [GRASP] has just been selected as a finalist at the 2014 Appy Awards in the Reference category. The winners will be announced at an event in New York on Wednesday May 21 as part of Internet Week. ApeApp is up against Ancestry.com and Merlin Bird ID from the Cornell Lab of Ornithology for Cornell University. The latter we previously collaborated with on our Build a Bird App. Thanks to everyone at I-SITE and GRASP for their passion about this project. We’ll keep the fingers crossed we beat out the very stiff competition, but of course are already very proud to have been selected as a finalist.